At first glance this scene could be mistaken for somewhere in Yosemite National Park, that's until you notice the orange rock, gum trees and creek bed. 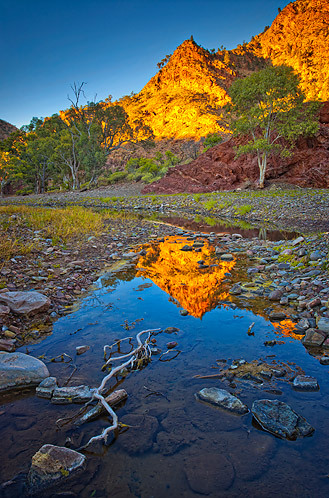 The location is Brachina Gorge, a very unique landscape. In the wet season or during big storms these creeks transform into raging rivers which sweep away unexperienced drivers trying to cross them. Luckily I was able to make this image before some big storms began to develop. A composition made from shapes was used in tandem with the yellow-blue complimentary colours to let this image come together beautifully.